I've been intrigued by social media traffic lately. Last week, I shared that I was starting a week long Facebook experiment for a site I recently purchased. Today, I wanted to share the results of that simple experiment. I basically took a site that I had purchased about a month or so ago and tried to drive some traffic from Facebook; where it wasn't really getting any before. The site I purchased is in the crafts niche, and is getting most of its 3,000 visitors a day from Pinterest. However, it had a Facebook page with nearly 4,000 Facebook fans, but wasn't being utilized. My experiment was this: Post links to old content from my site 3 times a day on Facebook for one week. Then see how much the traffic and engagement grows. On average, the site was getting just over 9 visitors per day from Facebook. As you can see, one of those days drove 107 visitors from Facebook. One of the posts we made that day got quite a few more shares and likes than the others and is clearly what drove the traffic. You can clearly see that my reach was dramatically improved over anything in early February. However, the post reach did not go up during the one-week experiment that I ran. In fact, it does not seem to be increasing at all. I think a big reason that my post reach was not increasing, was due to the low number of likes and shares that the content was receiving. You have to remember, that we (Perrin and I) didn't put much thought into the content we posted. We just took old posts from our website and scheduled 3 per day to go out on Facebook as links with a brief headline. In addition, the Facebook page may have had 4,000 Facebook fans, but it has been idle (nothing posted) for about 6 months. So, if we had a “fresher” Facebook audience, AND we applied some tactics to make our Facebook content more likeable and shareable, I think our post reach would be much greater. Overall, I learned a couple of important things from this Facebook test. 1. Facebook does indeed drive traffic. 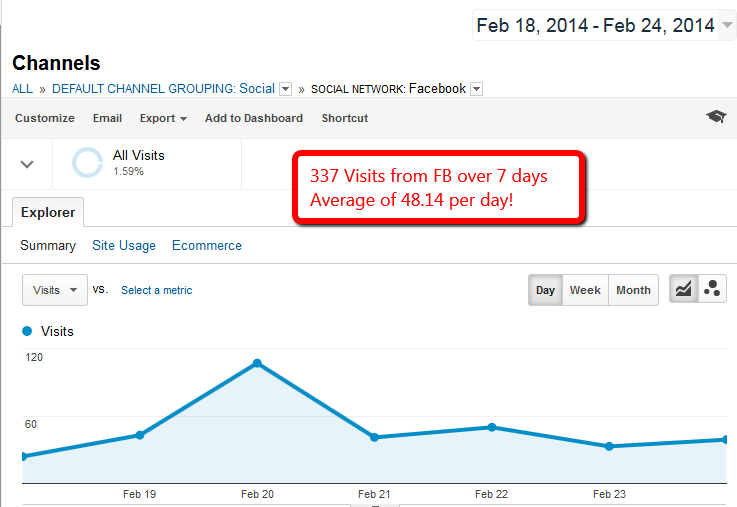 With relatively little effort, I was able to start getting nearly 50 visitors a day from Facebook. Yes, this is pretty small, but I think this could be scaled big time. 2. Better content on Facebook can drive even MORE traffic. Only one of our posts on Facebook did very well. But I've been doing some reading up on different Facebook tactics, and I do think with more consistent posting of certain types of content, the chances of a Facebook post generating good traffic goes up quite a bit. However, I also have to consider whether finding and posting content consistently to Facebook is worth the effort. For this small craft site that I bought, it may not be. The site earns around $10 a day or so, and I would have to drive alot of Facebook traffic to double the earnings. 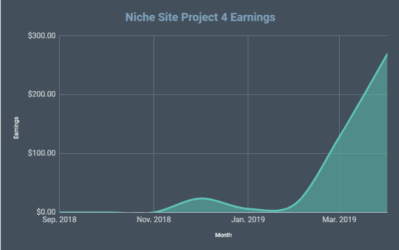 I may just grow this site a little more using Pinterest and then sell it in a short period of time after I make a few changes on the site to increase earnings. However, this experiment has REALLY got me thinking about how I could apply this to create a site that doesn't just make $10 a day, but one that makes much MUCH more than that. So, whether or not I continue to apply Facebook strategies to this little site is irrelevant. I think this week long experiment has shown me enough that traffic can indeed be “built” using Facebook. In fact, I probably did lots of things wrong with this experiment, and still got decent traffic without a ton of effort. If I take some of these principles from this small site and apply it on a bigger scale, I think Facebook could become a major traffic source for my next big project. Anyway, just wanted to give you a quick update on how my week long Facebook experiment went. If you have any comments or questions, let me know. Well done, Spencer! Yeah, valid points on why your reach didn’t seem to have increased. I can’t help but wondering though…building an audience of followers on Facebook of 4000 fans is not a task to be accomplished in a short period of time. Thanks for posting this update, Spencer. After reading about your recent project and the articles on ViperChill, I’ve been trying to use some of these tactics too, but I haven’t had very much success so far. From your experience and research, what types of content do better on Facebook? Content wise you’ll have to play around as each userbase responds differently. With that being said, start testing right now. Always encourage some form of user interaction like rate this or what do you think of this etc etc. Pictures with text work well. All depends on the niche, but lots of images is usually a good thing from what I hear. (Obviously, there’s more to it, but I’m still experimenting and will share what I learn). I know Facebook can be a powerful tool for driving traffic, I have tried to stay focused on specific things and not get too crazy with fan pages or social media profiles though. One source I know does work well is using Empire Avenue to drive extra engagement for free, I’ve found that to be a useful app when trying to increase likes, shares etc. I love case studies like this Spencer. 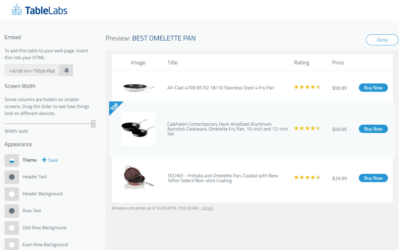 They provide unique content with actionable results. I have been recommending actionable posts, that I have found during February, to the readers of my blog. 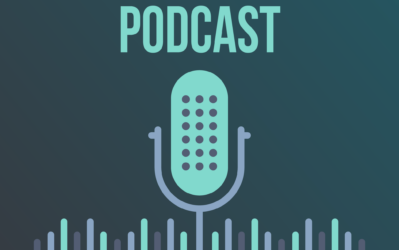 It is a roundup of impressive posts that I have read during the month so I have called it ‘e-Pearls of Wisdom: Actionable Blog Posts You Should Read’. I thought I was going to get to the end of February before finding another worthy post to add to the list. But you have just provided it. Thanks Spencer and Perrin. Great work & generous sharing! I’ve been seeing stuff about FB ads all over the place since Glenn’s article, definitely going to give this a try! Decent results. I’d be interested in a strategy on how to start a Facebook page from scratch and built it up to where it can quickly produce similar results. 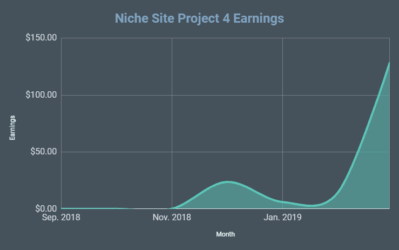 Interesting, I’ve been experimenting with Pinterest recently on one of my niche sites – still early days and not much results, but hearing other sites doing well with it is always encouraging! Facebook is a tool for driving traffic. yeah, focus on just two things: content and users. I use targeted Facebook ads to drive traffic to blog. 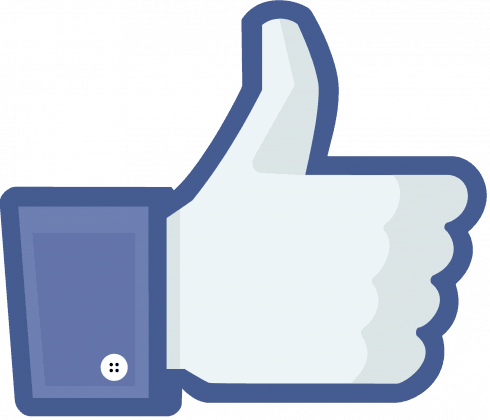 what is the benefit of your facebook campaign ? Great stuff as always. Whats intriguing to me about all this is that you didn’t pay a single dollar for that traffic. You can delete the link just wanted you to see the times of days and words to use and things. I thought it was cool. Might help ya with this. It’s been working a little bit for me lately when I’m consistent with it. When I’m not it falls apart like most things lol! Keep up the great work as always! That was a helpful link, thank you! 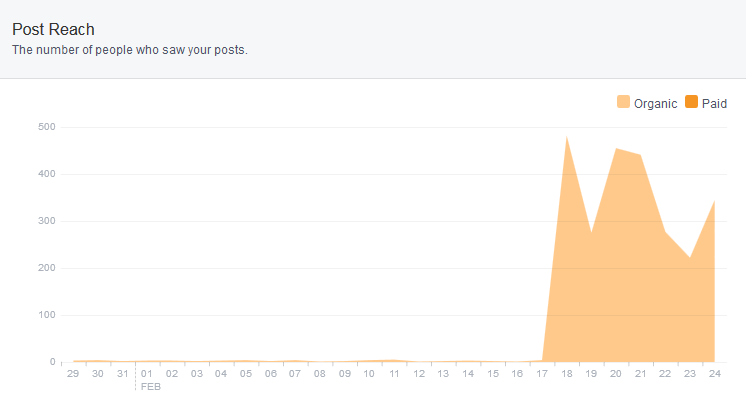 I was inspired to start a FB page for one of my niche sites this week after a manufacturer’s Facebook page shared one of my site’s reviews – suddenly I had loads of FB traffic coming in! Seeing that, I decided I should be on Facebook, but I’m just starting out. That site’s advice just kicked me about a mile up the learning curve. I had no idea FB engagement was highest on weekends, for example. I only use FB on weekdays when I’m bored at work… that’ll have to change! Thanks! Not a bad result from 4,000 Facebook fans. Especially since the fan page was inactive. Just looking at other sites with a social strategy, bigger sites like Viral Nova have over 1 million Likes, and Upworthy is at over 5 million Likes. Some of the smaller ones like EpicFail have around 150k. So it seems you’d need to have likes around the 5 or 6 figures before you see a decent amount of traffic. Anyway, good stuff, and now I’m curious what you have planned with Facebook in the future! Nice to see that a few simple posts from existing content can drive traffic to this new site you purchased….thanks for the update. Very cool, glad you’re doing this social experiment. Considering revenue per visitor is so low, using ads to drive likes or page views is likely nowhere near profitable for this site…However, will you be experimenting with that on this site? Can’t recall if you are going to or if you have or what, sorry. Would be cool to see any progress on that front, too. I’m not sure I’ll be trying that on this site. I have bigger plans for other sites. Very cool! I’m trying paid FB advertising right now, maybe you could post some tips on that too? I’m glad you opened a new channel of traffic. However, FB is still a social network and in order to utilize it to the full extent, I think, you need to invest time in socializing there. Anyway, it is interesting to see how you will scale the traffic from FB. Facebook has been a tool that i used to drive traffic to one of my authority website, i have a fanpage of about 55k+ and get more than 700 + daily. Nope, I will not do anything like viral nova. Hey niche boy..I’m back from my nightmare. Facebook drives traffic… But consider YouTube videos/any imbedded video that is awesome, and notice things really go through the roof. Videos are where it’s at. That was really great Spencer. That made me feel inspired to also try focusing on Facebook as traffic source aside from the traffic I am receiving from Pinterest and Twitter. Very nice. What was the engagement of the facebook traffic? Did they stick around on the site for a while? The FB traffic comes mostly to view the pictures, but it was a slightly longer time on site vs pinterest. How about a case study where you create a FB page from scratch for one of your existing sites and see how quickly you can get a bunch of followers? Or maybe create 2-3 FB pages and use a different tactic with each, to see which method gains followers the quickest? I have enough case studies going on already :). Thanks for sharing the results of your FB experiment! Are you considering monetizing the Pinterest traffic in any way? Like maybe building a list/CPL/CPA offers? 3,000 visitors is nothing to scoff at, Spencer. Oh…and what happened to your survival knife site? Did you delete it? I get the google error message whenever i try to load it. Yes, I plan on monetizing a bit better. And yes, I deleted the survival knife site – well technically moved it to a new domain. It still exists, but is now private due to all the negative SEO/copy cats the site gets. How does Google’s new Hummingbird algorithm affect keyword research and overall Niche websites in general? No major effect. People still are typing in the same queries they always have; Google is just starting to understand them better. If you have targeted the keywords well, Google will hopefully understand that your site is the best fit. interesting post! I have used FB tactics before but with not much success. I will def try some of the things you mentioned and see what happens. Thanks! Great job Spencer! Have you checked Insights to see what days and times most of your users are logged on? Try scheduling your posts during those peak times. I did that with my site, where Tues-Thurs 6-9pm were peak times, and noticed I got more reach and engagement when I scheduled posted during those times. Thanks for the tip. And yes, paid traffic may have to be included to help grow a fan page much faster. Spencer what is the goal of this FB traffic? I assume your niche site is adsense or some type of affiliate site? I’ve always read facebook traffic does not convert very well. 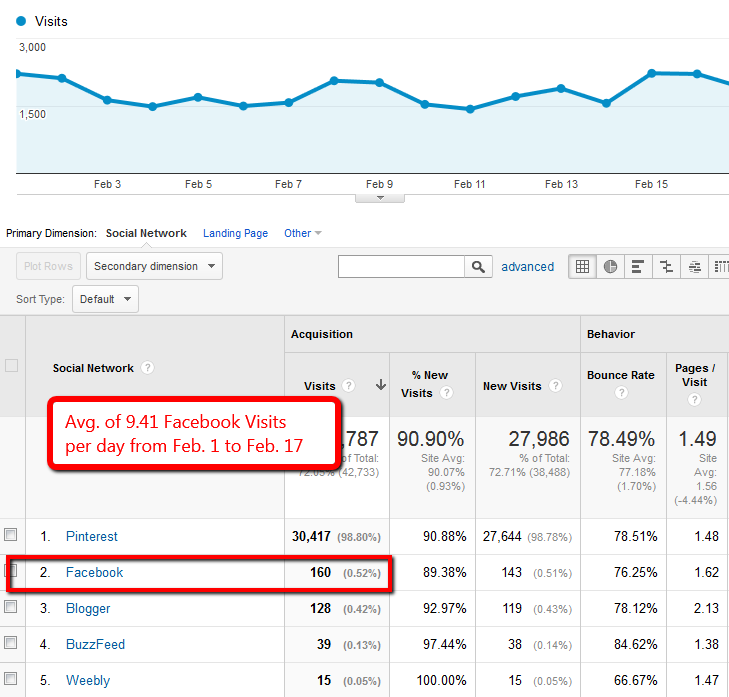 Is this new FB traffic you’re getting converting at the same rate as pinterest or other sources? Right now its simply to test how to drive traffic from facebook. Long term I have another project where FB will be more of a core for building and monetizing an audience. Those are some great results Spencer! I’ve been recently building up a Facebook fanpage for the same purpose of getting traffic to my site and its worked really well! I found that putting picture and video in definitely increased engagement and click through to my site. Also if I put in something funny, asked a question, or somehow engaged wit the audience they liked the post even more and were more likely to share the post with their friends. Once they share the post I was able to get a lot more organic reach with the posts as well. Things start to go viral at that point and you get a lot targeted traffic with minimal work and just a little bit of creativity. Great, but I have noticed that generally useless stuff is much more shared on facebook and with pages you need to spend on advertising to increase your reach. Yep, spend a little to make alot is the idea. What would be interesting to know is how the Facebook traffic converts compared to your other traffic. Traffic is good but money is much better! Hi Spencer! 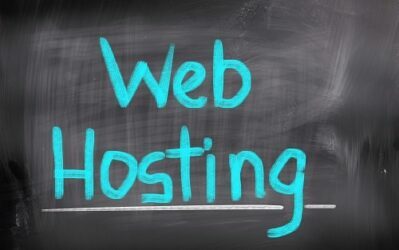 Any suggestions on how/where to buy established sites with a small amount of traffic that just needs growing? Spencer, first of all thank you very much for adding this valuable post. I would appreciate if you can share what mistakes you made in your facebook testing week. Third – For facebook tricks, tips which expert you follow or whose blog do you read. Thanks once again and looking forward for your detailed reply in this regard. my website’s traffic is all from Facebook. What I am doing is posting on FB groups. But it is very boring to do everyday posting to groups. yup u r very right.. spending some time on fb makes a good impact for your traffic..
That’s an interesting study Spencer. It would be interesting to see how this site gain earnings based on traffic from pininterest and FB. How many niche sites you are handling now?